PowerPoint is one of the best tool to make your presentation slides. But a traditional presentation slide can make your audience bore. That is why we are trying to come out with creative PowerPoint presentation slide design ideas. And the best thing is that we are providing this service for free of any cost. This PowerPoint template is made on a single slide but it seems like there are four. Here, we have used few flat colored rectangles with the infographics and used animations on them so that they looks attractive to the audience. The entry of each rectangle (I mean slide in a sense) can easily grab the attention. 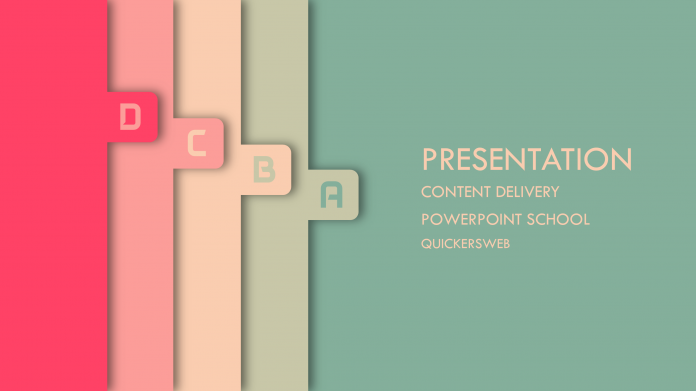 Moreover, this PowerPoint template is more suitable for a short and simple presentation. As this is a bit complicated one to make or edit, we recommend you to watch the tutorial video so that you get the clear idea. You may also visit our YouTube channel for more PowerPoint related templates and tutorials. 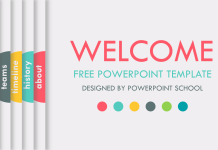 You can download this creative PowerPoint template for free of any cost. Just follow the download button and you will get the ZIP file. Here, we are providing some necessary information regarding this PowerPoint template. If you face any difficulties during watching the tutorial video, you may take help from here to get a clear idea. At first, you need to change the background color of your PowerPoint slide. To do so, go to design, click on format background and change the color. If you want to use the color that we have used, you may apply the RGB color values or use the eyedropper tool. As you can see this PowerPoint template is made on a single slide by using four different group of rectangles, you have to add four rectangles and infographics. Each rectangle will be grouped with the respective infographics and slide indicator text box. 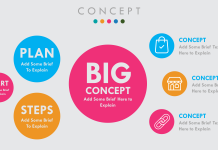 You should create all the necessary infographic in a different slide. Here, with the template file, you will get few infographics idea given. You may use those or if you want you can create your own. But make sure you group (Ctrl+G) those infographic with the rectangles. After adding all the rectangles in a single slide with the infographic, you have to add the animation on them so that those rectangles appear with the infographic one after another. We have used line animation from motion paths and set duration 1.25 seconds for each animation. If you want to use our customize colors, you may copy and paste the above mentioned RGB values. It is really simple just click on the custom color option from PowerPoint and paste the RGB value there. If you have liked our work, make sure you show us your kind support. This really inspires us a lot. Moreover, you may visit our YouTube Channel for more awesome works. Do you do custom work? If so, can you send me more info?